Stop, relax and take deep breaths. If shutting down your PC, and bringing a halt to its grinding whirrs, hisses and juddering clicks, ever gives you the same sense of relief as finishing a gym session, then it's time to drag your PC to the sound doctor. As with fast cars, there's a conventional expectation that powerful computers have to sound like they're trying to break the land-speed record, but with a bit of understanding about airflow theory, and a few bits of specialist kit, you can transform any PC from a furious elephant into a sleeping kitten. Whether you're attempting to quash the intrusive drone of a top-end gaming PC, or stop your media centre PC from distracting you during intense, quiet moments in movies, there are loads of ways in which you can calm the noise from your PC's mechanical guts. In fact, the raucous racket that's associated with PCs has become such a common complaint, that there's now a huge industry dedicated to making components specifically to sort it out. There's plenty to consider here, from alternative CPU and GPU coolers, through to dampening the rattling clicks that come from your hard drive. Of course, some methods are much more effective than others, so over the next few pages we'll show you which remedies we recommend for curing your PC's sonic ailments, and why. We'll tell you all the basics that you need to know about airflow, which kit is best for the job and what sorts of factors you need to consider when you're installing your new kit. But doesn't making your PC quiet mean you'll have to make sacrifices? Well, yes it does. You may not be able to overclock your CPU to the edge of hell and back, but you'll be able to get close to the first lava pool. It's surprising how much quieter you can make your PC with just a few tweaks, and without sacrificing too much in terms of performance. You can still build a high-end powerhouse PC that doesn't sound like it's harbouring a Lancaster Bomber within its whining insides, and you can easily dampen the din from a slim line media centre PC too. One slightly different approach to reducing your PC's noise is to use foam matting to create a sound absorbent barrier between your PC's insides and the outside world. Kits such as the AcoustiPack Lite (£23) enable you to line your case with an acoustic barrier, but be warned that these kits are really just one gun in your arsenal when it comes to silencing your PC, and they're not the all-silencing panacea that some people expect. Your case's airflow system will have been designed to draw in air from very specific places, and there will often be carefully positioned vents on your case's side panels, as well as the back. These are unfortunately where a great deal of the noise in your PC escapes, and it would also be thermal-suicide to cover them up with foam matting. If you block a crucial part of the intake or exhaust system then your airflow system stops functioning properly, meaning you have to increase your fan speed to make up the difference, which will negate the whole point of the matting in the first place. If you get the balance right, however, then kits such as these can still make a difference. If you cut the matting to avoid any vents, and stick it to your case's front and side panels, then you may not block out all the noise from your PC, but you will block a fair chunk of it. Bear in mind that this kind of matting doesn't actually produce a sound-proof barrier, either, but rather absorbs certain frequencies. You may find that a kit such as this won't make your PC quieter, but it will certainly block some of the annoying trebly frequencies that come from your fans. The first factor to consider is airflow. Most PC cases draw in air with an intake fan at the front (usually at the bottom), and then expel the air via an exhaust fan at the back. The idea is that air flows in one direction over the components, before it's then pushed out. 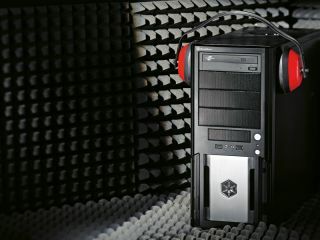 Basically, your case will have an intricately engineered airflow system with which you don't want to interfere. Even passively cooled components, such as motherboard chipsets, still rely on airflow. After all, the heat needs to go somewhere once it's been spread out by a heatsink. Some specially-designed chassis enable you to use the chassis as a heat-dump via heatpipes, but these have been specifically engineered for this purpose. You'll need to stick with the principle of airflow in a standard PC case, but you'll be surprised how quietly an air-cooled system can run with the right components. There's a common misconception that installing larger fans will make your system noisier than using smaller ones, but the opposite is generally true. The bigger the fan, the more airflow it can push out at a lower speed. Not only does a fan's noise level increase as you increase the speed, but so does its frequency – and it's that high-pitched trebly drone that's the most grating to human ears. The most common noise measurement you'll see on fan specifications is the decibel (dB), which defines the sound pressure level in relation to the limits of the human ear. A quiet office has a decibel level of around 30dB, and a standard human conversation with someone a foot away measures around 60dB. At the other end of the scale, a loud rock gig will hit around 110dB. This is only a measurement of sound pressure, though, which is why some fan manufacturers, such as Arctic Cooling, also quote fan noise using a psychoacoustic measurement such as 'sone'. Although human hearing has a frequency range of 20Hz to 22kHz, the 1kHz to 5kHz bracket is the most sensitive. A sone is made up of 40 phons, where a phon represents a 1KHz tone at 1dB. This means that one sone is a 1KHz tone at 40dB, and two sone represents double the loudness of one. Some manufacturers, such as Zalman, also quote decibels using the A-weighting (dBA), which weighs the curve in favour of the 1KHz to 6KHz frequency. Even so, both irritating and tolerable fan noise can still fall into this frequency bracket, so dBA isn't a foolproof measurement. Use these ratings as a yardstick for comparison, but always check reviews of fans to get an idea of their noise level too. A noise level under 20dBA or 1 sone is a general area to aim for here.